Why Are Complementary Currency Systems Difficult to Grasp within Conventional Economics? Pourquoi les monnaies complémentaires sont-elles ignorées par l’approche économique conventionnelle ? Les monnaies complémentaires (MC) permettent de comptabiliser et de régler des échanges de biens et de services dans un espace local et circulent en complémentarité de la monnaie officielle. Malgré leur actualité et leur nombre, la grande majorité des économistes semblent accorder une attention marginale à ces monnaies complémentaires. Cet article propose quelques facteurs explicatifs. Fondamentalement, l'économie conventionnelle est basée sur une approche méthodologique et sur des conceptions théoriques et normatives de la monnaie - son essence, son statut, sa taille et sa gouvernance - qui l'empêchent de comprendre ces dispositifs monétaires. Tout d’abord, l'hétérogénéité des MC et leur émergence nouvelle confrontent l'économie à un problème méthodologique de mesure de leurs impacts. Ensuite, nous montrons que, en raison de leur pouvoir d'achat limité dans le temps et dans l'espace, l'économie ne peut justifier leur utilisation dans l'économie marchande. Enfin, nous verrons que les règles monétaires d'émission et de régulation des MC empêchent les principales approches monétaires contemporaines de les reconnaître et de les légitimer. Complementary currency system (CCS) complements the official currency, with a view to accounting for and regulating exchanges of goods and services in a local space. Despite the topicality and the number of these complementary currencies, the large majority of economists seem to pay marginal attention to them. This article proposes some reasons to explain it. Fundamentally, conventional economics is based on a methodological approach and on theoretical and normative conceptions of money – its essence, status, size, and governance – that prevent it from understanding these monetary schemes. First, the heterogeneity of CCS and their new emergence confront economics to a methodological problem of measure of their impacts. Next, we show that, because of their limited purchasing power in time and in space, economics can’t justify their use in market economy. Last, we will see that the monetary rules of issuing and regulating CSS prevent main contemporary monetary approaches to recognize and legitimate them. 4.1. How monetary theories understand regimes of monetary plurality? 1By “complementary currency system” (CCS) we mean a specific unit (or system) of account that complements the official currency and has been developed by a group of agents (individuals, economic and social structures, local authorities or banks) that has formed a local network with a view to accounting for and regulating exchanges of goods and services. From a functionalist theoretical viewpoint CCSs are money. They fulfill the main functions of the latter by acting as a medium of exchange and unit of account within a defined geographic region or community, and in many cases also as a store of value. 2CCSs are by no means new to history; since the 1980s they have been attracting more and more attention and growing apace in both developed and developing economies. Some 3,500 to 4,500 systems have so far been recorded in more than 50 countries (Blanc, 2006; Seyfang, and Longhurst, 2013a). 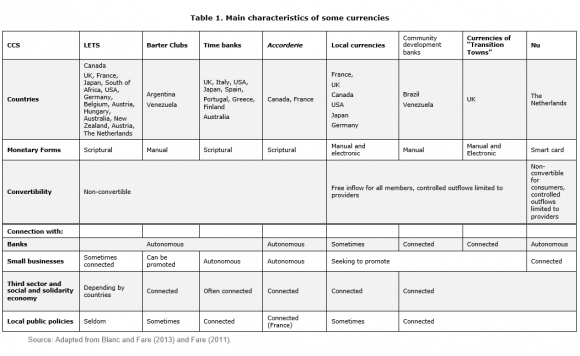 Among the better-known are LETS (Local Exchange Trading System) in Canada and the United Kingdom (Lee, 1996; Williams, 1996a), Time Banks in Italy and the UK (Coluccia, 2001; Seyfang, 2003, 2006), local currencies of barter clubs in Argentina (Gomez, 2009; Ould Ahmed, 2010), the Ithaca Hour in the United States (Collom, 2005; Jacob et al., 2004; Maurer, 2005; North, 2014), regiogeld such as Chiemgauer in Germany (Gelleri, 2009; Thiel, 2012), community development banks in Brazil (Borges, 2010; Melo et al., 2009; Neiva et al., 2013), the SOL (Fare, 2010, 2011), the Eusko and the SoNantes in France, the Brixton Pound, the Stroud Pound and the Bristol Pound in the UK (Ryan-Collins, 2011; Scott Cato and Suárez, 2012), the WIR system in Switzerland (Stodder 2009), and the Accorderies in Quebec and in France (Comeau and Boulianne, 2012; Fare, 2011). 3These monetary schemes have and objectives responding to challenges that echo the current context of crisis in the regime of financial globalization. They aim at reconciling sustainable local development with better social integration; at developing new standards of production and consumption (ecological, environmental, and solidarity-based); and at promoting new economic and monetary governance based on democratic sovereignty with civil society playing an active part. 4Despite the relevance of CCSs and their development, we note that it is a difficult topic to grasp within “conventional economic thought” (Lietaer et al., 2010)1 for a number of reasons. This article is an attempt to show that conventional economics is based on a methodological approach and on theoretical and normative conceptions of money – its essence, size, status and regulatory norms – that are an obstacle to understanding the emergence, logics and impact of these new monetary schemes. Firstly, according to the relative novelty of CCSs and their heterogeneity, conventional economics is faced with a methodological difficulty to assess their impact. Next we show that, because of the limited purchasing power of CCSs in time and space, this theoretical approach is unable to justify their use in the market economy. Lastly, we will show that the atypical rules governing the issue and regulation of these monetary schemes are an added obstacle to recognition and legitimation. The conclusion argues that other theoretical perspectives are more adequately equipped to study CCSs. 5Because of their very diversity and the fact that they have emerged relatively recently, complementary currency systems seem to pose a methodological problem to conventional economic thought. They have not yet been thoroughly studied. While there is a substantial amount of literature on CCSs, most existing works consist of individual-level surveys of one particular CCS (a case study), describing the motivations of users and promoters, the quantitative and qualitative characteristics of the scheme, and assessing its impact (Fare and Ould Ahmed, 2016). So far there is, however, no study summarising the overall impacts of these CCSs with the noteworthy exception of the excellent survey by Michel and Hudon (2015) that seeks to find out whether CCSs contribute to the three pillars of sustainable development. 6These methodological problems stem from the fact that there is to date no comprehensive database covering all CCSs on a worldwide scale and providing quantitative data on their users2. Without proper econometric studies – which are impracticable - it is difficult to account properly for individual behaviour, for quantitative aspects and for the logics involved. Fieldwork should be undertaken to obtain data through impact analyses. For example, Krohn and Snyder (2008), in an econometric study of local currencies in the USA, have shown that the local multiplying effect was too weak to be detected in growth per capita income during the 1990s. However, these results should be relativized: the authors failed to compare the volume of local currency in circulation (and the value added created in CCS) with that of the overall volume of money in circulation. In another context, using a random network-simulation model, Japanese economists such as Kichiji and Nishibe (2012) have shown that the distribution of money held by agents influences the rate of transactions carried out as a function of the money in stock. 7In general, however, there are few studies of this sort, because of the difficulty of quantifying and of distinguishing between exchanges conducted in CCSs and that using other currencies. These difficulties are also due to the extreme diversity of CCSs throughout the world. Besides this lack of directly usable data, the CCSs are not homogeneous: their material form varies – paper money, scriptural money, smart card3 – as does the conception of the role of money and its usages in the new market communities. CCSs also have a broad diversity of objectives: single or multiple (e.g. economic, social and environmental). The empowerment they aim to introduce can have different ideological bases and entail different modes of governance (Table 1). It can support a local economy established in the territory, integrate new ambitious production or consumption practices based on social and ecological standards. It can involve civil society in economic and monetary decision-making. While some systems, such as the Ithaca Hour money in the US (Maurer, 2005; North, 2014) are oriented towards support for the local production apparatus, employment, production and local dynamics, others target the growth of sustainable consumption, e.g. the green point customer fidelity cards of the NU-Spaarpass in Rotterdam (Sambeek and Kampers, 2004) and the eco iris in Brussels. Japanese complementary currencies that privilege social objectives by seeking basically to recreate traditional community bonds – local, and in some cases inter-generational (l’uchi) – offered from exploitative production relations (Hirota, 2006). 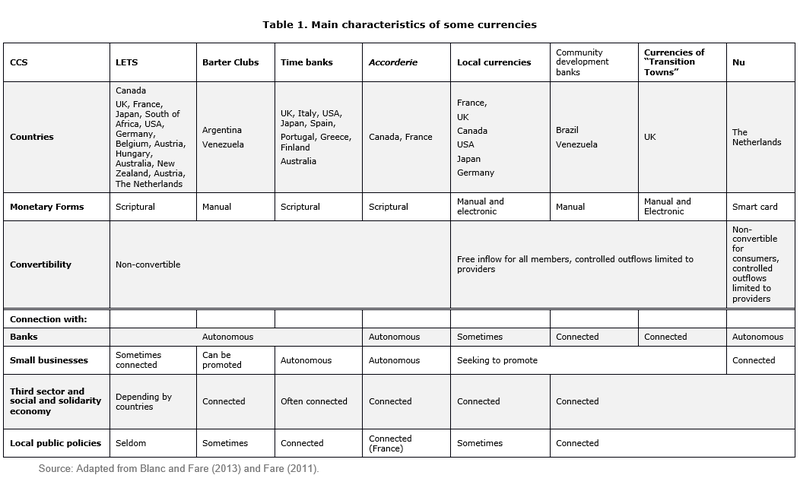 Complementary currency systems also differ in the degree of the connexion they set up with local authorities, banks, economic and social structures, and the third sector (Blanc and Fare, 2013). For example, the SoNantes launched in April 2015 at Nantes (France) developed close links with the municipality, local businesses, and the Nantes Municipal Credit (through its subsidiary Sonao), which handles the account management of this new complementary smart card. On the contrary, the SEL (France) base their autonomy on respect by the local authorities and set up a few partnerships. Furthermore a varied range of geographical contexts gives rise to CCS with socio-economic profiles of the actors involved. In Southern countries CCSs often emerge in reaction to an economic crisis and are related to population strata suffering from high degrees of social insecurity. These strata are usually impoverished and their support for complementary currency systems springs mainly from their economic needs. In contrast, CCS that emerge in Northern countries are linked to a more varied range of social strata (ranging from people in precarious positions to countercultural groups), and the motivations concerned are also more diverse (environmental or ideological, and not solely economic). A common geographical feature is that they primarily showed up in urban and peri-urban areas. 8In evaluating impacts, a methodological difficulty arises when we have to deal with the specifics of each CCS in terms of objectives, forms and social group profiles - particularly when using the widely randomized control trials proposed by Esther Duflo (Banerjee and Duflo, 201) and her J-PAL team (Abdul Latif Jameel Poverty Action Lab). Evaluation by means of randomized control is aimed at “establishing a credible comparison group, a group of individuals who, as there is no programme, would have given rise to results similar to those displayed in the programme” (Duflo, 2005, p. 188). Using this “control group” one can compare the effects on individuals of a programme, project or policy that is being envisaged. Surveys of this type usually aim at measuring the effects of a given programme in terms of monetary poverty at the individual level. This experimental approach can be useful in studying the impact of such-and-such a particular measure, but it is limited in its effects. It predetermines the objectives to be reached, then compares the results with these objectives, but without discerning other effects that might have affected the people involved in the process. This particular factor underlies (and undermines) efforts to establish direct causal links between the effects and the programme, and to neutralise the relevant structural and institutional conditions in which the programme is being carried out. Causality should not be treated probabilistically when the context makes generalisation problematic. This method takes into account only the average impact without capturing the diversity of effects, and does so only in the short term (Labrousse, 2010), hiding ripple effects and the effects of learning, composition and imitation (Bédécarrats et al., 2013). Furthermore, no explanation is given of the reasons, processes and causal mechanisms involved, the whys and the wherefores. It establishes only causal links between the programme and the effects. Yet the factors involved are multiple, as are the interactions. Effects resulting from interactions between multiple factors are always situated socially and bear the stamp of the context in which they take place. Because of this, causal links should be examined in all their complexity, with dynamic interactions grasped in context, and institutional and socio-economic dimensions taken into account. The effects of a programme cannot be defined uniquely in terms of predetermined objectives, nor can they be summarised by accumulating quantitative data unaccompanied by explanations. 9Current literature on CCS emanating mainly from economic geography, socioeconomics and institutional economics, uses alternative methodology. To evaluate the impact of CCSs, the authors adopt quantitative and qualitative criteria, the relevance of which is tied to forms and objectives that are proper to each monetary system. The indicators of assessment and the criteria adopted are heterogeneous, and as there is no standardized assessment tool common to all authors it is by no means easy to compare the various monetary experiments. This also stems from the emergence of research on CCSs that entails envisaging a great diversity of possible results without having adopted a comprehensive interpretative grid, as a closed grid of this sort would act as a barrier to the inflow of information from work going on in the field. We can, however, mention some indicators. The impact of CCSs can be measured by their ability to avoid financial and economic exclusion (Williams, 1996b). Two criteria are usually adopted for this: direct creation of jobs at local level, and increase in economic, social and human capital held by individuals in situations of exclusion. Seyfang (2003) selected as a criterion for measuring escapes from social exclusion the ability of CCS to enable users to assert their rights as citizens: social rights (integration into networks, bonds of reciprocity), economic rights (having an income; receiving recognition in work; consuming; saving), and political rights (participating in public and associative decision-making). Fare (2011) prefers three multi-dimensional criteria: territorialisation of activities (localisation of exchanges, creation of social links, participation in democratic process); intensification of the dynamics of exchange (development of access to credit, empowerment, struggle against poverty), and change in practices, lifestyles and social representations (responsible consumption, ecological citizenship, making organisations responsible, valorising the capacities of each and everyone, and collective empowerment). In the case of those CCSs that only have social aims, the main impact criterion adopted is the ability of the CCS to create social bonds of mutual aid and solidarity, using the Granovetter analytical grid that represents bonds as either strong or weak (Nakazato and Hiramoto, 2012). Their impact on the fight against social inequalities - and in particular inequalities that are gender-based - has also been measured (Bogani and Parysow, 2005; Lenzi, 2006). 10Whatever the criteria adopted to measure impacts, on the whole the individual-level surveys indicate that the impact of CCSs on local economic activity is slight when assessed in macroeconomic terms. This has been confirmed by Michel and Hudon (2015) in their impact survey. The absence of a marked impact can be explained in part by the fact that the CCSs concerned involved only low numbers of users and small volumes of activity (usually a few hundred to a few thousand users per CCS: see Table 2). Most CCSs involve relatively few people, with one notable exception, however: the Argentine barter clubs, which at one time involved 2.5 million people (Gomez, 2009). Seyfang and Longhurst (2013b) describe these monetary schemes as socio-technical niches: local grassroots innovations springing from citizens’ initiatives experimenting with alternative lifestyles and sustainable practices. They can be considered “small-scale”. When the size of these experiments is too small, however, their impacts remain marginal on the dynamics of local economies, as is shown in Krohn and Snyder or in Aldrige et al. (2003), who deal with LETS in the UK. Even in the case of Argentina - the largest in terms of the number of users and volume of transactions - Colacelli and Blackburn (2009) found that the barter clubs enabled Argentina’s gross domestic product to grow by only 0,6% in 2002. The impact of CCSs on economic dynamics is also influenced by the conditions under which money circulates. Furthermore, Kurita, Miyazaki and Nishibe (2012), in a study of coupons in Japan, have shown that the degree of knowledge of a currency has a forceful impact on its circulation. Similarly, according to McBurnie (2012), there is a positive correlation between the awareness of its benefits and the desire to use a currency. This leads us to infer that action has been taken to make non-users aware of the alternative system with a view to expanding the population of CCS users. As far as conventional economics is concerned – an approach that usually operates on a far grander scale – the limited scale of the CCS is problematic: these monetary systems are apparently judged too insignificant to make much difference to the overall economy. 11CCSs confront conventional economics with a second kind of problem: the difficulty of justifying their use in market economies. 12According to this approach, money is defined as a universal medium of exchange accepted by everyone and without costs in a given geographic area. This is its value. It constitutes a promise of goods to its holder. Money is thought of as an invention of the market economy aimed at moving beyond barter. In the beginning there was barter, then money appeared: a means of solving the famous problem of the double coincidence of needs. The fable of the double coincidence of needs is one of the classic explanations of the emergence of money. It crops up as early as 1776 (Smith 1995), and then in 1892 (Menger), and persists implicitly today in models of pure monetary theory (Kiyotaki and Wright, 1993), despite a broad consensus among historians, anthropologists, heterodox economists, and sociologists of money refuting this imaginary genesis (Aglietta and Orléan, 1998; Davies, 1994; Ingham 2000, 2002; Testard, 2001). This monetary genesis is totally in line with their theoretical conception of money. If money is defined as a pure economic object, as an instrument of exchange, then its genesis stems from a purely functional model: as there is a logistical problem to solve, the device to solve it will be invented accordingly (Ould Ahmed, 2010). In this perspective, the emergence of alternative currencies is understood in terms of currency substitution, of competition between currencies to become the universal means of payment. The substitution of currencies stems from a theoretical conception of money that is based on the postulate of its fungibility, money being seen as a universal means of payment, with no unit bearing any sign that could distinguish it from another of the same value. The use of one currency rather than another is therefore simply the result of optimal monetary arbitrages by agents in terms of yield or of the transactional costs entailed in the use of alternative currencies. 4 For a historical approach to monetary experiments of the 19th century, see North (2007). 13However, the creation and development of CCSs cannot be grasped within this theoretical conception of money. On the one hand, if one analyses the reasons for which CCSs have come into being, these particular monetary arrangements are not the result of arbitrage on the basis of the comparative transaction costs and yields of different currencies; their emergence is not linked solely either to the problem of liquidity shortage of the official currency or to a monetary crisis that could have led to recourse to alternative currencies. This latter type of explanation does hold, however, for the first local monetary experiments of the 19th and early 20th century4. At the time, local currencies usually corresponded to emergencies, appearing during periods of war, monetary crisis or cash-flow difficulties, and disappearing when the monetary and economic conjuncture improved or when the public authorities prohibited their circulation (as in the cases of the Wära, the Valor and the Wörgl). As of the 1990s, however, this was no longer the only explanatory factor involved. Agents’ motivations were not exclusively monetary in nature; they also entertained economic, social and/or environmental objectives (Fare, 2011; Seyfang and Longhurst, 2013a). This was the case for example with the local currencies of Transition Towns in the UK, set up with a view to transforming and re-localising sectors such as energy, healthcare, farming, and business – in order to make the territory more resilient and better able to cope with climate change and peak oil. 14On the other hand, in view of their limited functional properties, the use capacity of CCSs in the world of trade is narrow limited in time and restricted to certain types of commodity exchanges. CCSs do not resemble money that is accepted by all concerned parties and is cost-free in the such-and such a geographical area. They are more like “special” purpose currencies, in the terminology of Polanyi (1957). With the development of complementary currencies we see the emergence of heterogeneous forms of money (Ingham, 2001, 2004), and in particular a plurality of territorially confined means of payment with delimited social uses. In this way, money should produce and serve determinate objectives and values (ecological, social, non-capitalist, etc.) claimed by a local market community. 15In the first place, they have territorial limits: they can be used only in specific geographical regions. They can also be limited to particular communities (Blanc, 2002): the circulation and value of currencies have to be validated by voluntary adherents of the systems. The community or association in question has to be set up for the sake of the money, which is created by a citizens’ movement (Blanc, 2013). Furthermore, some currencies are used by specific actors. Some initiatives, for example in France, local currencies (the Abeille, the Mesure, the SOL Violette, etc.) promote the direct consumption of socio-economic partners who respect social and environmental criteria that have been incorporated into a charter, following the application of selection criteria (Blanc and Fare, 2016). Although these charters often appear as banners, they affirm the values and the symbolic universe of the payment community. The purchasing power of these currencies can be narrowed still further by rules of usage and mechanisms of monetary issuing and regulation. Most CCSs in circulation are not legally convertible into official currencies (Table 1). Local currencies (often in paper or electronic form), however, assume a possibility of conversion, in particular because they integrate into the circuit enterprises producing and distributing goods and services. A fixed relation of equivalence is set up to link the local to the national currency, and both can be used at any given time. It is possible to enter into the local system from the national one by converting one currency into the other; but exit from the system is not always possible; when it is, it reserved for professionals; penalties (in the form of a conversion tax) are attached to exit, in order to limit the risk of mass sell-offs of the local money (e.g. the Brixton Pound in UK, the Abeille in France). 16Moreover, there are limits to the complementary currencies use in space, but this is not all. Some CCSs have time limits to their validity. Money can carry a demurrage fee, according to a principle devised by the economist Silvio Gesell (1958): its face value decreases regularly (over three to six months), and can be restored only by adding a complement (affixing a stamp that has to be purchased). Conservation fees can thus be attached to the money in order to encourage circulation and discourage accumulation. Money becomes perishable, “like goods and labour” (Gesell, 1958, p. 215). This monetary theory was encouraged by Keynes in The General Theory of Employment, Interest, and Money (book 6, note 23) during the US great Depression. Local currencies based on a system of stamped notes (subject to a cost of demurrage, and depreciating with time) were inaugurated by the Wära that circulated in 1930 in Schwanenkirchen (Germany), followed by the Wörgl in Austria in 1931, the “Valor” in France in 1933, and the Stamp Scrip in the USA, also in 1933 (under the influence of the economist Irving Fisher5). Later, in France during the 1950s, a system of local vouchers was developed in Lignières-en-Berry and in Marans; very much later, in Argentina, in some currencies used by barter clubs; and, as of the new millennium, in Germany, in regional currencies (such as the Chiemgauer); and, last but not least, the Stroud pound, launched in the UK in 2009 (Scott Cato and Suárez, 2012), and in France in local currencies (for example the Abeille). 17A regime of monetary plurality consists in a diversity of units of account and means of payment within a given space (defined in terms of markets and territories). The development of CCSs has set up a particular regime of monetary plurality, characterised by the coexistence of official and community currencies used in compartmentalised commercial spaces that though distinct from one another are nonetheless inter-related. Having briefly revisited monetary approaches that are able to apprehend monetary plurality regimes, we will now examine the limits of these regimes in accounting for the particular case that interests us in this article. 18We have examined in synthesis the way in which the main contemporary economic theories account for – or fail to account for – the regimes of monetary plurality (Blanc et al., 2017). Three sets of approaches have been identified. The first set makes no allowance whatever for monetary plurality. Only State money is perceived as real money, and only the official authorities can issue it. No unofficial means of payment circulating in a territory governed by State authorities can be recognised as money (Lerner, 1947). This is the case in particular with the Chartalist school, following the work of Knapp (1924). Monetarism also reserves for the State alone the right to issue money. If the neutrality of money is to be guaranteed and inflation controlled, money – or rather, the money supply – cannot be allowed to come from a private source. Monetary plurality constitutes a violation of sovereign rights, and alternative currencies are simply forgeries (Wray, 1998). 19A second set of theories recognises a plurality of issuers and of instruments of trade. The space provided is nonetheless conditional: the unit of account must be unique. On the question of the unit of account, however, there are two very different approaches, not only to monetary organisation, but also to economics in general. Post-Keynesianism, post-Marxism and the French Regulation School (Aglietta and Orléan, 2002; Théret, 2008) see monetary plurality as a characteristic of the monetary economy of production. They reject the hypothesis of an exclusive right of the State to issue currency, and recognise a plurality of private issuers (e.g. banks, and even enterprises), who put into circulation a diversity of means of payment (i.e. of private debts). Nonetheless, to enjoy the status of money, these private debts must conform to the monetary rule, i.e. prove their capacity for conversion into the official currency. Approaches of this type are based on a conception of monetary and banking systems as hierarchies over which preside the official currency (the unique unit of account) and the official monetary system. Monetary plurality is seen as an expression of the plurality of instruments of trade, with levels of acceptance (liquidity) that vary (a factor in times of crisis), and/or with varying yields. If these alternative currencies are not convertible, the plurality is seen as a pathology of the monetary system. According to another approach, and in particular to some cash-in-advance models (particularly Sturzenegger, 1992) and search models (Kiyotaki and Wright, 1993; Kocherlakota and Krueger, 1999), monetary plurality is seen as a result of optimal selection by rational economic agents. This operation is framed in a decentralised economy regulated by competition between markets, with money being treated as an instrument of exchange. Simultaneous circulation of different instruments of trade (e.g. fiat money, national currency, foreign currency, interest-bearing check accounts, commodity money, credit cards, and so forth) is seen as problematic, as the currencies are not perfectly interchangeable and have different yields and degrees of acceptability. 20The last set of approaches takes a normative view in advocating monetary plurality. These approaches presuppose the existence of a decentralised market and perfect competition. Examples are Mengerian theories of money (Free Banking; the competitive fiat money model) and monetary theories that integrate financial economics [New Monetary Economics initiated by Black (1970) and Fama (1980)]. Monetary functions are no longer carried out by a single currency; the unit of account is issued either by the central bank (in Free Banking and the competitive fiat money model) or by the market (NME); it is not linked to the plurality of competing bank currencies that serve as instruments of business, the value of which is determined by the market (the financial market in the case of NME). Competitive fiat money models (Hayek, 1978; Klein, 1974) go even further than this, supposing in addition a plurality of units of account: banks have their own trademarks and issue their own scrip as a means of payment. Monetary plurality is analysed as an optimal arrangement that is nonetheless subject to the existence of a unique or common unit of account that regulates the system. NME and the competitive fiat money models envisage regulation by the market only, and reject all rules of convertibility applicable to private moneys on conversion into the central currency. A central currency is nonetheless recognised to guarantee the stability of the system, in the case of competitive flat money. NME sets up competition between private banking currencies treated as (interest-bearing) financial assets, and inter-bank settlements are channelled through clearing houses. Free Banking (Selgin and White, 1994), does not reject centralisation of inter-bank compensation operations and the need to convert one by one private bank currencies into a central public currency (the single unit of account). 21Monetary plurality approaches mark out the limits of possibility as far as the issuer of money is concerned, at the same time as the legal status of the currency itself, the relationship between different currencies within a single space, and the regulation of the monetary system as a whole. We shall now explain why CCS can only be problematic to the hypothetical, theoretical and normative thinking in these approaches. 22As to the issuer, first of all these theories recognise only two types: the State and banks (but also sometimes, though rarely, enterprises). CCSs, however, are issued by none of the above, but by actors who belong to civil society. Monetary specialists presumably greet monetary initiatives of this sort with a sceptical smile; they see money as a mere tool, supposedly technical; its creation and management are matters for technical experts and legitimate official institutions. Creation of money by actors of civil society is a breach of the traditional practice of monetary sovereignty and of the legal status of national currencies, always held in law to be sovereign and exclusive. National and supra-national monetary systems today appear always to be characterised by a unitary conception of money and a hierarchical organisation headed by a central issuing authority ensuring the convertibility of private currencies into the central currency and ensuring the stability of the system. Historically, however, the conception of money as homogeneous and unique has at times been challenged. This conception has not always corresponded incontrovertibly to reality. Considerations of this sort, however, have always remained largely marginal; reminders by the central sovereignty seem to have sufficed to discourage temptations to dissidence. This is why CCSs invite all stakeholders in the economy to question their own roles and positions, and to reflect on the part that could possibly be played by complementary monetary schemes6. What impact would complementary schemes have on the issues raised by the organisation of today’s societies (democratisation, new sources of wealth, new values, commons, preservation of resources, transition/transformation of behaviour patterns and levels of awareness, etc.)? 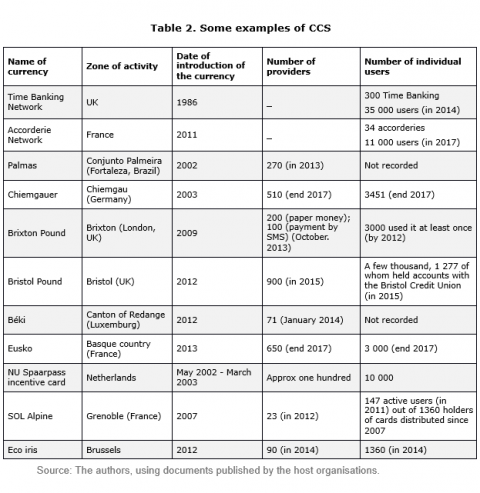 Studies on CCS in the political economy of money, and a number of case studies (Argentine barter clubs, SEL in France, LETS in UK, Green Money in Hungary, Green dollars in New Zealand, etc), show that CCSs can play a part in re-territorialising the sphere of politics by creating new spaces for a contestation and liberation of the monetary order (Laacher, 2003; North, 2007; Ould Ahmed, 2009). CCSs can be seen as social organisations with political aims, their objective being to construct, by means of collective action, new economic and social bonds that respect new values rather than the prevalent capitalist norms. In these new systems, the bonds formed between participants are not merely social; they are also “politicised”, as Laacher (2003) has rightly pointed out. In most cases these bonds are established outside conventional political structures, representatives and spaces (Ould Ahmed 2014). However, it is above all the leaders and organisers of these CCSs who experience the political component as such; the rank-and-file users’ expectations are more practical, both materially and symbolically. 23A second characteristic of money is its status. Monetary theories are based on the idea that the status of money is part of law. Only State money and the official means of payment are recognised as real money. Recognition of the monetary nature of private bank currencies is conditional (according to the theory concerned) on the convertibility of the private currency into other currencies and/or into the State currency. Money is recognised as money by its legality and convertibility. As CCSs exist in a legal vacuum, as is often the case, they do not enjoy legal recognition as money and as legal tender. Absence of legal recognition, however, has not precluded, in some cases, recognition of their social utility (e.g. the case of community development banks in Brazil, which are recognised as instruments that can be used in the struggle against poverty and exclusion). Their legal framework is currently being worked out or is at least being discussed. For example, in 2013, the French supervisory authority on banking and insurance officialised its position on French complementary currency systems, indicating the legal framework that it intended applying to them7; some currencies have been recognized and incorporated into the law on the social and solidarity economy (this is the case in France since 2014). Discussions of the same sort are in progress elsewhere, in particular in Belgium and the UK, and are advancing at various rates. For the time being, however, there is no regulatory framework into which they fit or that recognises their specificity (Blanc and Fare, 2013). 24Most of these currencies have not been recognised by official monetary institutions, whether private or public. They are not officially convertible into either private (i.e. bank) or public (State) currencies. Not being recognised as part of the official monetary system, most of these arrangements are not subject to supervision and regulation by the central banks of their respective countries. Lacking convertibility into other currencies of any sort (community, bank, national, foreign exchange), their existence is usually tenuous. Their purchasing power as we have seen is restricted to the community space in which they circulate. An exception should nonetheless be pointed out: that of local currencies that in fact are convertible into private bank currencies and, are also apparently in some cases subject to supervision by the central authorities. Their capacity for conversion, however, does not flow from a legal obligation but from organisational options taken at the time of their inception. 26A socio-economic and institutional approach to money seems more helpful in revealing the nature, logics and impact of the complementary monetary practices. Research on this specific perspective started out in the field of economic geography and subsequently moved towards those of socioeconomics and institutional economics. They reject the reductive conception of money as merely a universal means of payment. Money is defined as a fundamental social institution of all societies: the institution that enables people to settle debts thanks to the practices of accounting and payment. 27This presupposes on the one hand that a specific method is adopted for evaluating impacts in conducting field surveys that use such methods of sociology and anthropology as participatory observation8 or qualitative field surveys9. 28This methodological pluralism makes it possible to mobilise methods and tools that are proper to the research that is under way or are shared with other disciplines (quantitative and qualitative, using individual and/or collective interviews and surveys based on questionnaires). This combined methodology helps to reveal the multidimensional nature, the specific logics and the implications of CCSs. A perspective of this sort is incompatible with the classic economic view of money as a “natural”, neutral element in the economic process, and gives pride of place to money viewed as a social construction. It mobilises a comprehensive set of tools, starting out with an observation of monetary practices, and progressively formulating theoretical concepts and elaborating them on the basis of experience. This orients research towards the production of highly contextualised primary data generated directly in the actual practice of fieldwork. Sociological and anthropological methods are necessary for the proper evaluation of many CCS, especially those that aim to create social bonds of mutual aid and solidarity. As a result, impact studies of CCSs give precedence to the analysis of social utility (Defourny and Nyssens, 2008), in order to deepen the grasp and understanding of CCSs. 29On the other hand, these approaches highlight the fact that money is the common medium or expression of the value that a community returns to each of its members in the form of an act of payment corresponding to that which is deemed to have accrued to the community from the member's activity (Aglietta et al., 2016; Aglietta and Orléan, 1998). By obtaining complementary currency in return for the trade of goods or services, a member obtains purchasing power in this community. This means that constraints on the validity of these currencies can, seen from this point of view, be interpreted as advantages. 30Indeed, seen from the point of view of a local economy, their local validity can be advantageous. In the restricted territory in which they are used, these currencies can have a beneficial effect on local economies, affecting them in an endogenous manner (consumption taking place inside a local monetary and territorial space; creation of resources and of new outlets and of jobs), and thereby promoting a new development model, based on local producers or enterprises and extra-economic values. The combination between microcredit and local currency, as in the Brazilian experiment, constitutes a particularly powerful development tool by financing productive activities inside the territory and improving the local supply. Use of a local and territorial currency can also strengthen local community links and local identity, as for example the community development banks do in Brazil (Neiva et al., 2013; Fare et al., 2015). Under certain conditions a setup of this sort can increase or improve the territorial economic effects of CCSs. Local authorities can play a decisive role here (Blanc and Fare, 2013a). Recognition of the social utility of CCSs by public authorities and economic decision-makers could increase their potential influence on the entire socio-economic system. For example, local authorities could accept the payment of public services and of local taxes in local currencies (this is already the case with the Bristol Pound in the UK, to take one example). When they are combined with other mechanisms and instruments used by the local authorities and their partners, the leverage effect of CCSs also increases by connecting up the logics and tools stemming from the social and solidarity economy (the “third sector”) and applying them to social and economic development. Nevertheless, unlike CCSs that have economic objectives, those that have social aims do not seek to expand their scale of application. This is the case in particular with the French SEL (Laacher, 2003; Servet, 1999), with Time banks (Seyfang, 2004), with Accorderie (Fare, 2012) and also with some Japanese local currency systems, the chiiki tsûka (Hirota, 2006; Nakazato and Hiramoto, 2012). 31Last but not least, an institutional approach to money enables us to conceive of monetary plurality regimes and to interpret this plurality in terms of subsidiarity (Fare, 2017) rather than competition. Indeed, the qualitative criteria for conversion and the differentiation inherent in CCSs invalidate the hypothesis of pure fungibility of money (Blanc, 2008). This leads us to prefer a theoretical approach that allows for complementarities, and even for subsidiarity in monetary matters instead of restricting the relationship to one of competition (Fare, 2011). In the matter of sustainable territorial development, Fare (2011, 2017) investigated the conditions affecting the establishment and acceptability of CCS and their appropriate scale, suggesting a monetary design based on subsidiarity in this particular context of monetary plurality, i.e. subsidiarity based on the implementation of monetary schemes at the lowest relevant level. This amounted, finally, to pressing the principle of complementarities to its limit, determining for each currency (taking account of the relevant objectives according to each model of CCS) a single and singular scale for deployment in the framework of rejuvenated territorial governance. The diversity of scheme makes it possible to think of possible complementarity between these currencies so as to satisfy the objectives of sustainable territorial development. Subsidiary currencies thus seek to implement democratically a specific currency at each relevant level and at the best decision-making level for achieving the objectives assigned to them in the perspective of answering the challenges of sustainable local development. Boïk (2014) also suggests using a first-in-class micro-simulation model of a local-national currency system based on the principle of monetary subsidiarity within the framework of LEDDA (Local Economic Direct Democracy Association). LEDDA economic direct democracy is a local, parallel economic system that synthesizes a host of local, open, and participatory approaches to make them scalable, efficient, secure, stable, and user-friendly. Aglietta, Michel and André Orléan (eds) (1998). La monnaie souveraine, Paris, Odile Jacob, 398 pages. Aglietta, Michel and André Orléan (2002). La monnaie entre violence et confiance, Paris, Odile Jacob, 378 pages. Aglietta Michel, Pepita Ould Ahmed and Jean-François Ponsot (2016). La monnaie. Entre dettes et souveraineté, Paris, Odile Jacob, 460 pages. Aldridge, Theresa J, Alan Patterson and Jane Tooke (2003). Trading Places: geography and the role of Local Exchange Trading Schemes in local sustainable development, in Susan Buckingham and Kate Theobald (eds), Local Environmental Sustainability, Cambridge, Woodhead, pp.169-194. Banerjee, Abhijit and Esther Duflo (2011). Poor Economics. A Radical Rethinking of the Way to Fight Global Poverty, New York, Public Affairs, 320 pages. Bédécarrats, Florent, Isabelle Guérin and François Roubaud (2013). L'étalon-or des évaluations randomisées: du discours de la méthode à l'économie politique, Sociologies pratiques, vol. 2, n°27, pp. 107-122. Black, Fischer (1970). Banking and the Interest Rates in a World without Money, Journal of Bank Research, Autumn, pp. 9–20. Blanc, Jérôme (ed) (2006). Exclusion et liens financiers : Monnaies sociales, rapport 2005-2006, Paris, Economica, 547 pages. Blanc, Jérôme (2008). Fongibilités et cloisonnements de la monnaie, in Eveline Baumann, Laurent Bazin, Pepita Ould Ahmed, Pascale Phélinas, Monique Selim, and Richard Sobel (eds), L’argent des anthropologues, la monnaie des économistes, Paris, L’harmattan, pp. 29-54. Blanc, Jérôme (2013). Penser la pluralité des monnaies à partir de Polanyi : un essai de typologie, in Isabelle Hillenkamp and Jean-Louis Laville (eds), Socioéconomie et démocratie. Nouvelles perspectives polanyiennes, Paris, Eres, pp. 241–269. Blanc, Jérôme and Marie Fare (2013). Understanding the role of governments and administrations in the implementation of community and complementary currencies, Annals of Public and Cooperative Economics, vol. 84, n°1, pp. 63-81. Blanc Jérôme and Marie Fare (2016). Turning values concrete: the role and ways of business selection in local currency schemes, Review of social economy, vol. 74, nᵒ 3, pp. 298-319. Blanc Jérôme, Ludovic Desmedt, Laurent Le Maux, Jaime Marques-Pereira, Pepita Ould-Ahmed and Bruno Théret (2017). Monetary plurality in economic theory, in Georgina Gómez (dir. ), Monetary Plurality Around the World: Theory and Practice, Place, Routledge, forthcoming. Bogani, Esteban and Javier Parysow (2005). Perspectivas de desarrollo económico y social para las mujeres pobres y empobrecidas en los clubes de trueque. Estudio de caso: “La Bernalesa” in Fortunato Malimacci and Agustín Salvia (eds), Los nuevos rostros de la marginalidad, Buenos Aires, Biblos, pp. 151–173. Boik, John (2014). First Micro-Simulation Model of a LEDDA Community Currency-Dollar Economy, International Journal of Community Currency Research, vol. 18, A, pp. 11-29. Borges, Adriano (2010). Banco dos Cocais. Uma experiência inovadora de bancos comunitários, in Leandro Morais and Adriano Borges (eds), Novos paradigmas de produção e consumo. Experiências inovadoras, São Paulo, Instituto Polis, pp. 295-341. Colacelli, Mariana and David Blackburn (2009). Secondary currency: An empirical Analysis, Journal of Monetary Economics, vol. 56, n°3, pp. 295-308. Coluccia, Paolo (2001). La Banca del tempo, Turín, Bollati Boringhieri, 143 pages. Comeau, Yvan and Manon Boulianne (2012). Les réseaux d’échange de proximité au Québec. Bilan d’une enquête statistique, Revue internationale de l’économie sociale, vol. 91, n°324, pp. 35-52. Collom, Ed (2005). Community Currency in the United States: the social environments in which it emerges and survives, Environment and Planning, 37, pp.1565-1587. Davies, Glyn (1994). A History of Money: From Ancient Times to the Present Day, Cardiff, University of Wales Press, 950 pages. Dodd, Nigel (2014). The social life of money, New York, Princeton University Press, 456 pages. Douthwaite, Richard (1996). Short circuit: strengthening local economies for security in an unstable world, Totnes, Green Books, 400 pages. Duflo, Esther (2005). Évaluer l'impact des programmes d'aide au développement : le rôle des évaluations par assignation aléatoire, Revue d'économie du développement, vol. 19, n°2, pp. 185-226. Dupré, Denis, Jean-François Ponsot and Jean-Michel Servet (2015). Le bitcoin, une tragédie du marché, in Rapport de la mission d’études sur les monnaies locales complémentaires, 2e partie, ministère de l’Économie sociale et solidaire, Paris, pp. 18-22. Fare, Marie (2010). The SOL: a Complementary Currency for Social Economy and Sustainable Development, International Journal of Community Currency Research, vol. 15, pp. 57-60. Fare, Marie (2011). Les conditions monétaires d’un développement local soutenable: des systèmes d’échange complémentaire aux monnaies subsidiaires’, Ph.D. Thesis. Lumière Lyon 2 University. Fare, Marie (2017). Sustainable territorial development and monetary subsidiarity, in Georgina Gómez (dir. ), Monetary Plurality Around the World: Theory and Practice, Place, Routledge, forthcoming. Fare, Marie, Carlos de Freitas and Camille Meyer (2015). Territorial Development and Community Currencies: Symbolic Meanings in Brazilian Community Development Banks, International Journal of Community Currency Research, vol. 19 (D), pp. 6-17. Fare, Marie (2017) and Pepita Ould Ahmed (2017), Complementary Currency Systems and their Ability to Support Economic and Social Changes, Development and Change, vol. 48, n°5, pp. 847–872. Gatch, Lauren (2012). Tax Anticipation Scrip as a Form of Local Currency in the USA during the 1930s, International Journal of Community Currency Research, vol.16, D, pp. 22-35. Gelleri, Christian (2009). Chiemgauer Regiomoney: Theory and Practice of a Local Currency, International Journal of Community Currency Research, 13, pp. 61-75. Gesell, Silvio (1958). The Natural Economic Order, London, Peter Owen Ltd, 402 pages. Gomez, Georgina (2009). Argentina's Parallel Currency: The Economy of the Poor, London, Pickering and Chatto, 256 pages. Gomez, Georgina (2010). What was the deal for the participants of the Argentine local currency systems, the Redes de Trueque, Environment and Planning A, vol. 42, n°7, pp. 1669-1685. Gomez, Georgina (2012). Governance and sustainability of the Argentine Complementary Currency Systems, International Journal of Community Currency Research, vol. 16, pp. 80-89. Hirota, Yasuyuki (2006). Les expérimentations de monnaies locales au Japon: les monnaies au service de l’Uchi, in Jérôme Blanc (ed), Exclusion et liens financiers: Monnaies sociales, rapport 2005-2006, Paris, Economica, pp. 11-23. Ingham, Geoffrey (2000). Babylonian Madness: On the Historical and Sociological Origins of Money, in John Smithin (ed), What is Money?, London, Routledge, pp. 16–41. Ingham, Geoffrey (2001). Fundamentals of a theory of money: untangling Fine, Lapavitsas and Zelizer, Economy and Society, vol. 30, n°3, pp. 304-323. Ingham, Geoffrey (2002). De nouveaux espaces monétaires?, in OCDE (ed), L’avenir de l’argent, Paris: OCDE publications, pp.139-164. Ingham, Geoffrey (2004). The nature of money, Cambridge, Polity Press, 264 pages. Jacob, Jeffrey, Merlin Brinkerhoff, Emily Jovic and Gerald Wheatley (2004). Hour Town - Paul Glover and the Genesis and Evolution of Ithaca Hours, International Journal of Community Currency Research, vol. 8, pp. 29-41. Kiyotaki, Nobuhiro and Randall Wright (1993). A Search-Theoretic Approach to Monetary Economics, The American Economic Review, vol. 83, n°1, pp. 63-77. Klein, Benjamin (1974). The Competitive Supply of Money. Journal of Money, Credit and Banking, vol. 6, n°4, pp. 423-453. Knapp, Georg Friedrich (1924). The State Theory of Money, London, Macmillan, 306 pages. Kocherlakota, Narayana and Thomas Krueger (1999). A Signaling Model of Multiple Currencies, Review of Economic Dynamics, vol. 2, n°1, pp. 231-244. Laacher, Smain (2003). Les SEL. Une utopie anticapitaliste en pratique, Paris, La Dispute, 171 pages. Labrousse, Agnès (2010). Nouvelle économie du développement et essais cliniques randomisés: une mise en perspective d’un outil de preuve et de gouvernement, Revue de la régulation, vol. 7, n° 2, pp. 2-32. Lakomski-Laguerre, Odile and Ludovic Desmedt (2015). L’alternative monétaire Bitcoin : une perspective institutionnaliste, Revue de la régulation, vol. 18, 2 semestre, 22 p.
Lee, Roger (1996). Moral Money? LETS and the Social Construction of Local Economic Geographies in Southeast England, Environment and Planning D, vol. 28, n°8, pp. 1377-1394. Lenzi, Catherine (2006). L’enquête nationale sur les systèmes d’échanges locaux (SEL) en 2004, in Jérôme Blanc (ed. ), Monnaies sociales, Rapport Exclusion et liens financiers 2005-2006, Paris : Economica, pp. 253-279. Lerner, Abba Ptachya (1947). Money as a creature of the state, American Economic Review, vol. 37, n° 2, pp. 312-317. Maurer, Bill (2005). Mutual Life, Limited. Islamic Banking, Alternative currencies, Lateral Reason, New York, Princeton University Press, 240 pages. Melo, Joaquim, Elodie Becu and Carlos de Freitas (2009). Viva Favela! Quand les démunis prennent leur destin en main, Paris, Michel Lafon, 284 pages. Menger, Karl (1892). On the origin of money, Economic Journal, vol. 2, n°6, pp. 233-255. McBurnie, Johanna (2012). Investigating the Role of Money: The Case of Salt Spring Dollars, Economics, University of Victoria (BA Thesis). Michel, Arnaud and Marek Hudon (2015). Community currencies and sustainable development: A systematic review, Ecological Economics, vol. 116, issue C, pp. 160-171. Nakazato, Hiromi and Takeshi Hiramoto (2012). An Empirical Study of the Social Effects of Community Currencies, International Journal of Community Currency Research, vol. 16, pp. 124-135. Neiva, Augusto Câmara, Juliana de Oliveira Barros Braz, Carolina Teixeira Nakagawa and Thais Silva Mascarenhas (2013). Banco Palmas: Resultados para o Desenvolvimento Comunitário e a Inclusão Financeira e Bancária, in Joaquim Melo and Juliana de Oliveira Barros Braz (eds), Banco Palmas 15 anos: Resistindo e Inovando, São Paulo, A9 Editora, pp. 105-178. North, Peter (2014). Ten Square Miles Surrounded By Reality? Materialising Alternative Economies Using Local Currencies, Antipode, vol. 46, n°1, pp. 246-265. North, Peter (2007). Money and Liberation. The Micropolitics of Alternative Currency Movements, Minneapolis, University of Minnesota Press, 240 pages. Ould Ahmed, Pepita (2009). Les formes du politique dans les clubs de troc. Le cas de l’Argentine (1995-2007), in Natacha Borgeaud-Garciandia, Bruno Lautier, Ricardo Penafiel and Ania Tizziani (eds), Penser le politique : la recréation des espaces et des formes du politique en Amérique latine, Paris, Khartala, pp. 231-246. Ould Ahmed, Pepita (2010). Can a community currency be independent to the state money?, Environment and Planning A, vol. 42, n°6, pp.1346-1464. Ould Ahmed, Pepita (2014). What does ‘solidarity economy’ mean? Contours and feasibility of a theoretical and political project, Business Ethics: A European Review, vol. 24, n°4, pp. 425-435. Ould Ahmed, Pepita and Jean-François Ponsot (2015). « Contestations monétaires : une économie politique de la monnaie », Revue de la régulation, vol. 18, n°1, pp. 1-11. Polanyi, Karl (1957). The economy as instituted process, in Conrad M. Arensberg, Harry W. Pearson and Karl Polanyi (ed), Trade and Market in the early empires - economies in history and theory, New York, Free Press, pp. 243-270. Rolland, Mael (2017). Les crypto-monnaies à l'aune des monnaies parallèles, sociales et complémentaires: continuité et rupture dans le champ de la gouvernance monétaire, quatrième conférence internationale sur les monnaies sociales et complémentaires, Barcelone, 10 -14 mai 2017. Ryan-Collins, Josh (2011). 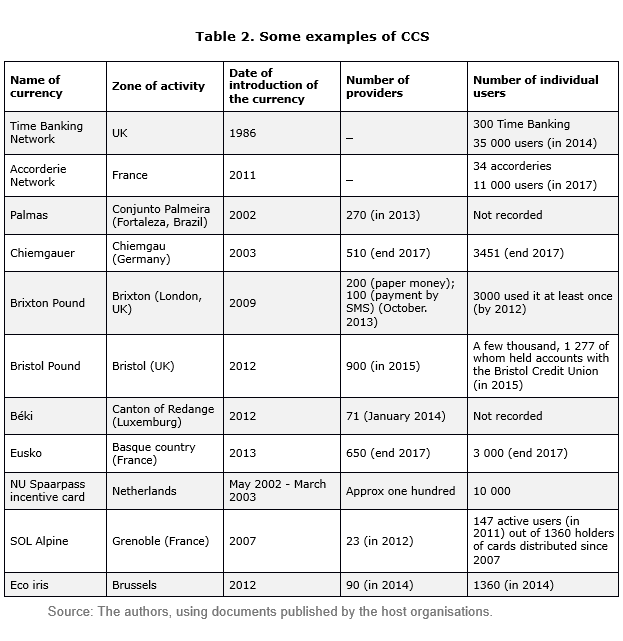 Building local resilience: The emergence of the UK Transition Currencies, International Journal of Community Currency Research, vol. 15, pp. 61-67. Sambeek, Paul van, and Kampers, Edgar (2004). NU-Spaarpas: The sustainable incentive card scheme, Stichting Points, Amsterdam, Mimeo. Scott Cato, Molly and Suárez Marta (2012). Stroud Pound: A Local Currency to Map, Measure and Strengthen the Local Economy, International Journal of Community Currency Research, vol. 16, pp. 106-115. Selgin, George A. and Lawrence H. White (1994). How Would the Invisible Hand Handle Money?, Journal of Economic Literature, vol. XXXII, n°4, pp. 1718-1749. Servet, Jean-Michel (ed) (1999). Une économie sans argent. Les systèmes d’échange local, Paris, Seuil, 344 pages. Seyfang, Gill (2003). Growing Cohesive Communities One Favour at a Time: Social Exclusion, Active Citizenship and Time Banks, International Journal of urban and regional Research, vol. 27, n°3, pp. 699-706. Seyfang, Gill (2006). Sustainable consumption, the new economics and community currencies: developing new institutions for environmental governance, Regional Studies, vol. 40, n°7, pp. 781-791. Seyfang, Gill and Noel Longhurst (2013a). Growing Green Money? Mapping grassroots currencies for sustainable development, Ecological Economics, vol. 86, pp. 65-77. Seyfang, Gill and Noel Longhurst (2013b). Desperatly seeking niches: Grassroots innovations and niche development in the community currency field, Global Environmental Change, vol. 23, pp. 881-891. Smith, Adam (1995). Enquête sur la nature et les causes de la richesse des nations, Paris : Presses Universitaires de France, 4 vol., XLVII-1429 pages. Sturzenegger, Frederico A. (1992). Inflation and Social Welfare in a Model with Endogenous Financial Adaptation, UCLA Economics Working Papers 658, Los Angeles. Testard, Alain (2001). Aux origines de la monnaie, Paris, Editions Errance, 144 pages. Théret, Bruno (ed) (2008). La monnaie dévoilée par ses crises. Crises monétaires d’hier et d’aujourd’hui, Paris, Editions de l’EHESS, 512 pages. Thiel, Christian (2012). 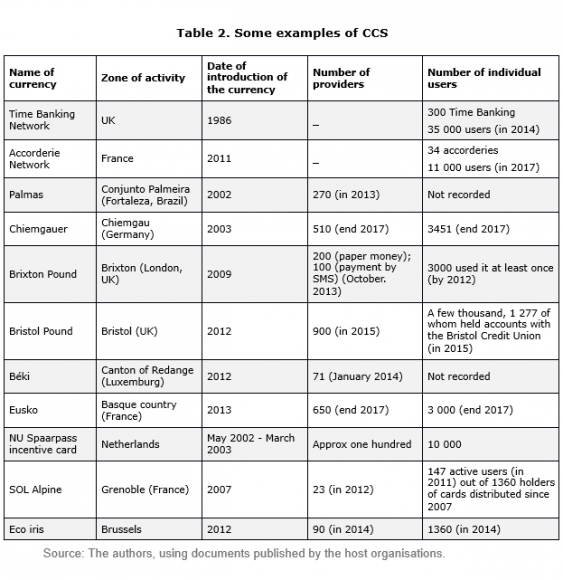 Moral Money – The action guiding Impact of Complementary Currencies: A Case Study at the Chiemgauer Regional money, International Journal of Community Currency Research, vol. 16, pp. 91-96. Williams, Colin C. (1996a). The new barter Economy: an appraisal of Local Exchange and Trading System (LETS), Journal of Public Policy, vol. 16, n°1, pp. 85-1001. Williams, Colin C. (1996b). Local Exchange Trading Systems: a New Source of Work and Employment, Environment and Planning A, vol. 28, pp. 1395-1415. Wray, Randall (1998). Understanding Modern Money: the Key toFull Employment and Price Stability, Cheltenham, Edward Elgar, 208 pages. 1 As Lietaer et al., (2010) we use the term of “conventional economic thought” which assumes that the monopoly of fiat national currency is an unquestionable given and therefore which ignores monetary plurality. 5 During the US Great depression in the 1930s, Fisher proposed to set up this kind of monetary rule to Roosevelt (but he didn’t convince him) (Gatch, 2012). 6 For an analysis of considerations underpinning the right of non-governmental actors to create new currencies, see in particular Dodd (2014). 8 It’s a method stemming from anthropological practice, which favours direct observation by the researcher of practices, and takes time and place into account in the researchers’ observations. 9 “Spot” studies, discontinuous but repeated, focused on the life-trajectories of actors (by means of semi-directive surveys and interviews, statistics) stemming from anthropology and qualitative sociology.